Three cheers to Kareena Kapoor for being the best-dressed actress at Filmfare Awards 2009. 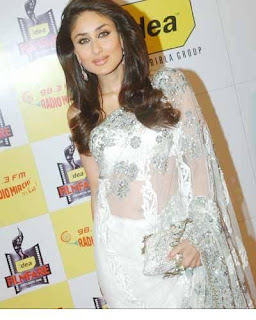 She looked stunning in a white saree with silver and crystal work. From makeup to hairstyle and wardrobe, she carried it all well. Bipasha Basu looked her sizzling best in a transparent black saree beautifully matched with a revealing red blouse. We count her too in one of the best-dressed actresses at Filmfare Awards 2009. She too sticked to her Indian look in this saree. Seems like Aishwarya has got bored of wearing those weird gowns at her Hollywood movie “Pink Panther 2” premiers, so she decided to come as an Indian Bahu in a golden and black saree. Look at the picture and you will realize she has gained some weight. After the actresses clad in saree, came the actresses in gowns. To start off the best-dressed actress in a gown was none other than the Best Actress of 2008, Priyanka Chopra, who looked gorgeous in a grayish black gown. Priety Zinta looked equally beautiful in a well-cut black and silver gown. Thank God, Priety changed her corporate look this time and came dressed as a sweet princess in a gown. Genelia D’Souza rocked and looked superb in her black gown. Though the gown was not so charming, she carried it off well and looked great with her charms. Sonam Kapoor seemed to be tired of her Delhi 6 salwar kameez look and came in a completely glam look in a white one-shoulder dress. Her hairstyle too was interesting. Anoushka and Asin both looked fabulous in their gowns. Anoushka wore an off-white gown. Asin was seen in a purple gown and for the first time with her hair tied and not open. Is Kareena Kapoor afraid of water?